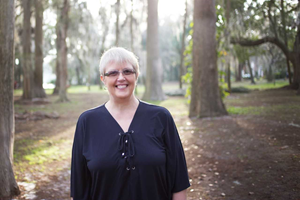 Michelle “Shelly” Jean Darnell (nee Wilcox), 61, passed away on June 1, 2018 in Oviedo, Florida. Michelle was born on September 3, 1956 in Muskegon, Michigan and lived an extraordinary life. She was intelligent and driven, a hard worker with an adventurous spirit who loved to travel. She was also creative, funny and a gifted storyteller. Michelle was a voracious reader, loved movies and had a passion for music with a beat and soul. She was an excellent swimmer and at peace in the water. With a love for motorcycles and the freedom of the open road, she would reminisce fondly of her Harley Davidson Sportster. Michelle loved the holidays especially Christmas. Her favorite Christmas traditions included eating chocolate covered cherries, baking sugar cookies and opening one gift one Christmas Eve. As a struggling single mother, Michelle was ahead of her time in the 1980’s as one a few female nuclear technicians in the world. In the 1990s she went on to earn a B.A. from Columbia College. Later in life Michelle renewed her faith in God and was a member of the Aloma Church. Above all, Michelle loved her family. She was incredibly proud of her two children and cherished her five grandchildren. Michelle is preceded in death by her mother Jean Meirs, her father Edward Wilcox and nephew Phillip Schiefelbein, Jr. Michelle is survived by her son Dennis R. Smith, daughter Jessica Thackway (Richard), grandchildren: Christian Ferguson, Mason Smith, Ethan Thackway, Isabella Smith and Gemma Thackway, brother Michael Wilcox (Estol), sister Lori Schiefelbein (Phil), nephew Ross Schiefelbein and step-father Merrit Meirs. Mother, grandmother, sister, daughter, friend… forever in our hearts. A memorial and a scattering of her ashes will take place in Michelle’s hometown of Muskegon, Michigan and is targeted for June 2019 near the anniversary of her passing. In Michelle’s memory please consider donating to the Lupus Foundation of America (www.lupus.org). To share your memories of Michelle or to leave a special condolence message for her family, please click the Share Memories button above. Add your memories to the guest book of Michelle Darnell. I want to extend my condolences to you. Michelle talked often about your long talks and how you would reminisce about your childhood memories, and laugh until she cried. She als ooften talked about her desire to move back to Muskegon; and I wish she would have been able to realize that dream. I really miss my daily talks to my awesome friend. She was the greatest. I just wanted you to know how much comfort you gave her and that she counted on being able to talk to you about so many things.